Sophomore Donminic Lewis got the Challengers off to a hot start, then scored a game-tying three to put the game in overtime, and was big in overtime as Cascade fought off their crosstown rival at home. Lewis led the Challenger charge with 22, Layne Collom added 15, and Kiegan Schaan 11 as the boys had one of their better scoring nights. As always Nathan Spurlock was key around the hoop, and Bradyn Coppedge hauled down a number of Crusader misses from his guard spot- none more important than a missed free throw by St. Mary’s in OT. The win ties Cascade with Brookings-Harbor for second place in the Far West League. 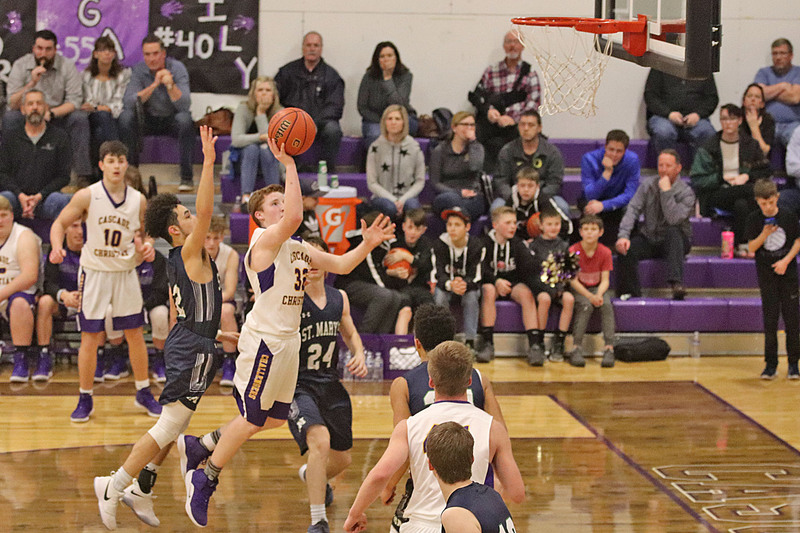 The two square off for the regular season finale Tuesday, while the third-place Crusaders try to topple Sutherlin- not an impossible task for a talented team. If the Challengers win, they will play a league playoff game Thursday at the CCHS Pavilion. If both the Challengers and Crusaders lose, then Cascade Christian plays the Bruins again on Thursday night at Brookings. If St. Mary’s wins and Cascade Christian loses- it causes a third-place tie, then the two teams settle third place in a special, neutral site playoff game, and the winner there moves on to play Brookings-Harbor. Who would ever have thought the Challengers would be in this position after starting the season 2-13?